Interested in opening a savings account for your kids? It's actually very easy! We have been planning to open a savings account for our eight-year-old daughter for the longest time but haven't gotten around to it until now. We decided to deposit cash gifts she collected over the holidays and other gifts she would be receiving in the future. She was very excited with the idea of having a passbook in her name, too. We first inquired over at BPI (Bank of the Philippine Islands) - SM Fairview branch but they only open accounts for kids 10 years old and above. We then dropped by BDO (Banco De Oro) and they allow parents to open savings accounts for kids of all ages (even newborns!) 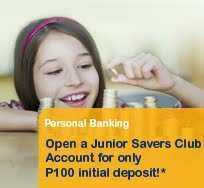 for initial deposits of as low as P100. Then we filled in an application form and that's all! We got in a bit of a dilemma in the part where my daughter was asked for three signature specimen. She claims that she signs her name with a heart (a star sometimes, whenever she feels like it) and asked me if that's okay. I thought about it and said well, she should probably not, just keep it simple, you know. I just told her to write her name - in cursive if she wants, for a bit of drama. When that's over and done with, we waited for a bit and then we got our (well, her) Junior Savers passbook! I opened a BDO Junior savers account for Holly when she was just a year old. We plan to do the same for Cyrus when we get the chance to go to Cagayan de Oro (could change, depending on the husband's decision). As children, we were raised to value saving, and so I made sure to begin my children's savings as early as possible. BDO Cabanatuan,MegaCenter Branch required CERTIFICATE OF ENROLLMENT and BARANGAY CLEARANCE in addition to school ID's and ID pictures. Is the requirements in manila differ in the province?